Warm your home or enhance your Christmas liturgies with this lovely collection of old and new Christmas carols from Gregory Norbet. Enjoy the peaceful, comforting songs of Gregory Norbet this Christmas. This collection offers new insights into the Christmas story with poetry, melody and his own gentle style of song. It includes both original compositions and well-known songs for the Advent/Christmas season. This 13-song MP3 album by Gregory Norbet features old and new Christmas carols for the Advent/Christmas season. 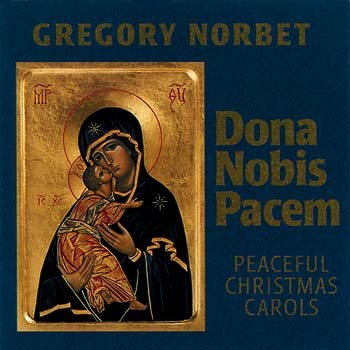 Enjoy the peaceful, comforting songs of Gregory Norbet throughout Advent and Christmas. This collection offers new insights into the Christmas story with poetry, melody and Gregory’s own gentle style of song. It includes original compositions like “Peaceful, So Peaceful” and “All Through the Night,” two lovely songs about the night of Jesus’ birth. Featuring a total of 13 songs, the collection also includes arrangements of more traditional carols for the Advent/Christmas season such as “What Child Is This” and “Lo, How a Rose E’er Blooming.” Whether you’re looking for calming music for your home or a peaceful song to enhance a Midnight Mass liturgy, Dona Nobis Pacem will surely fill the need. The supplementary songbook offers a variety of accompaniment parts for the seven original compositions on the collection.